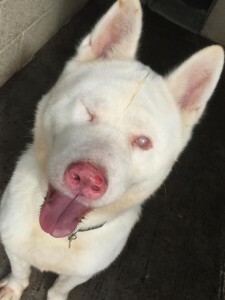 Diesel is our very special, friendly white Akita (possibly cross Husky). He is such a lovely boy who is so friendly and full of character. Diesel is sadly blind, but he copes with this amazingly well and once used to his surroundings, you wouldn’t know he can’t see. He is currently in a foster home with 2 other sled dogs who he adores, he needs slow introductions to dogs, but once he’s bonded he loves their company and loves to play. Diesel absolutely loves his walks, and walks quite nicely on a harness. He can be rehomed with children over 14. Diesel is fully housetrained and fine to be left for a few hours on his own. He is really responsive and sits nicely for a treat and gives both his paws! He’s such a loveable boy who will make a fantastic companion for his lucky new family. 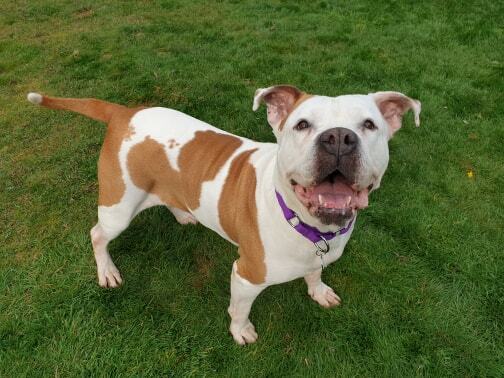 We are looking for a home who have some experience of his breed, with a decent sized secure garden for him as he loves to be outside (but also loves snoozing on the bed if he’s allowed!! ).